"Transceiver 2" Reclaimed lumber, wooden dowels, stain, polyurethane. 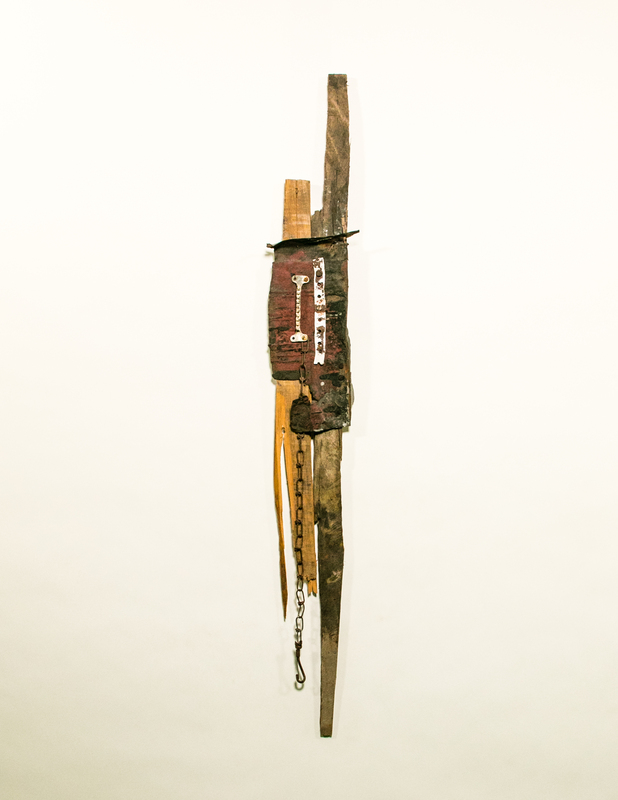 8" x 51" x 3.75"
"Cinnabar 2" Found objects, concrete, reclaimed lumber, paint. 4.75" x 9" x 1.75"
"Brush-off 5" Found objects, reclaimed lumber, paint. 5.5" x 13.25" x 3"
The Shrines illustrate my obsession with revering objects that most consider useless by placing them in a context of worship. 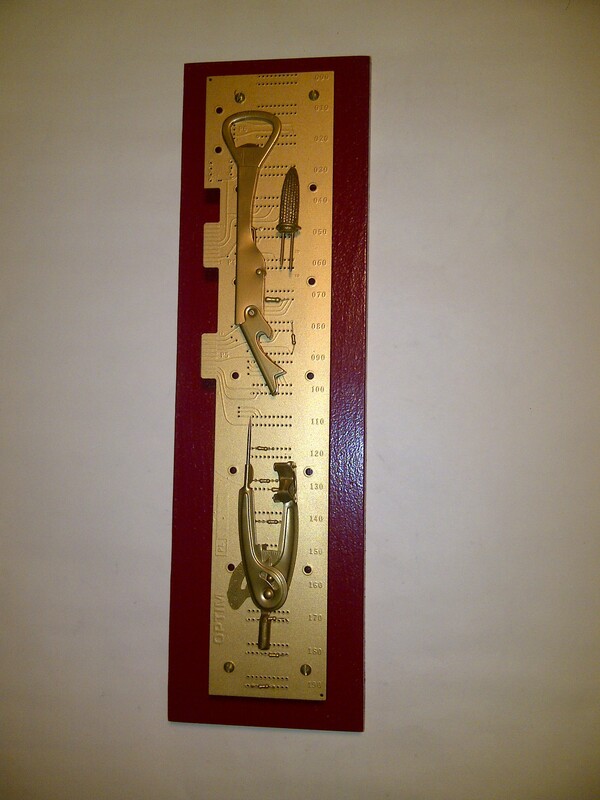 A rusty bolt, a broken window or a chunk of battered wood is freed from its former mundane purpose and is now elevated to a status of pure beauty. What we discard says more about us than what we keep. The Signets are inspired by potent and expressive characters I see in Asian styles of calligraphy. They are meant to be stark and cryptic, and any resemblance to actual characters is purely coincidental. 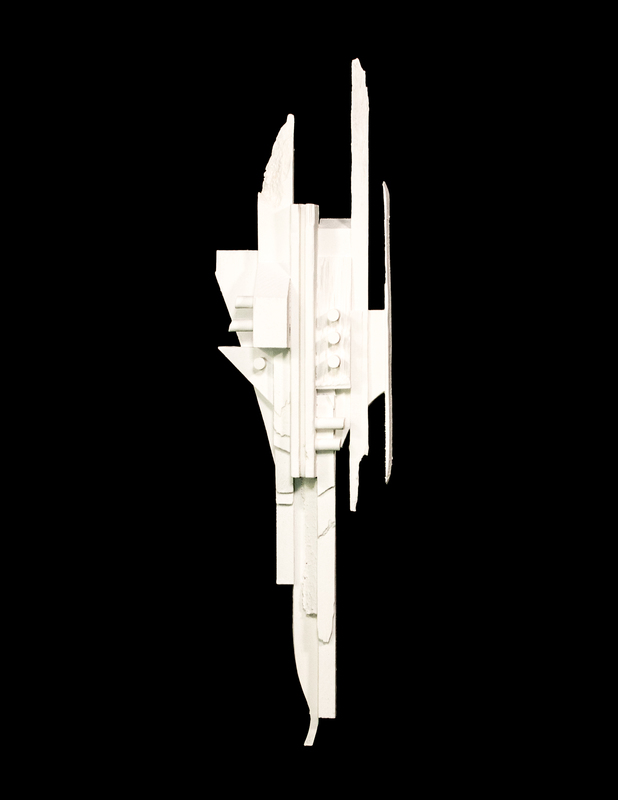 Essentially, they are a simplified version of the Shrines, which were done several years previously. 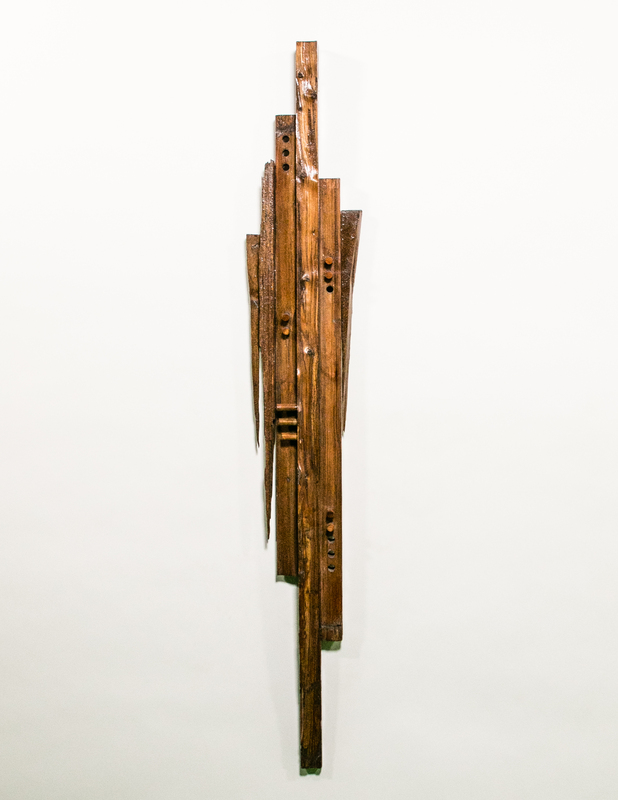 The wooden frames in the Dream Gate series are made from sections of a 30-year old fence that I knocked over with my car one night when I came home. There was a girl in the front seat next to me and she had distracted me. All the baubles inside and around the perimeters of the boxes are things I collected over the years because I found them curious: my brother’s old toys, antique Christmas decorations, old photographs, etc. They came together by way of esthetic considerations rather than by themes. Though each little object has a sentimental significance to me, I find them more interesting when put together out of context. 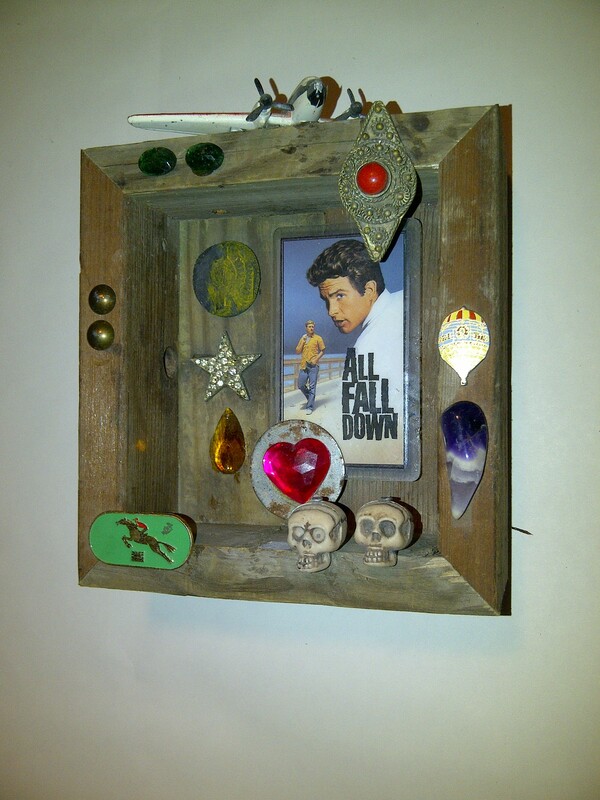 "Shrine 6" Reclaimed lumber, found objects, glass, paint. 24" x 37" x 4"
"Shrine 3" Reclaimed lumber, found objects, paint. 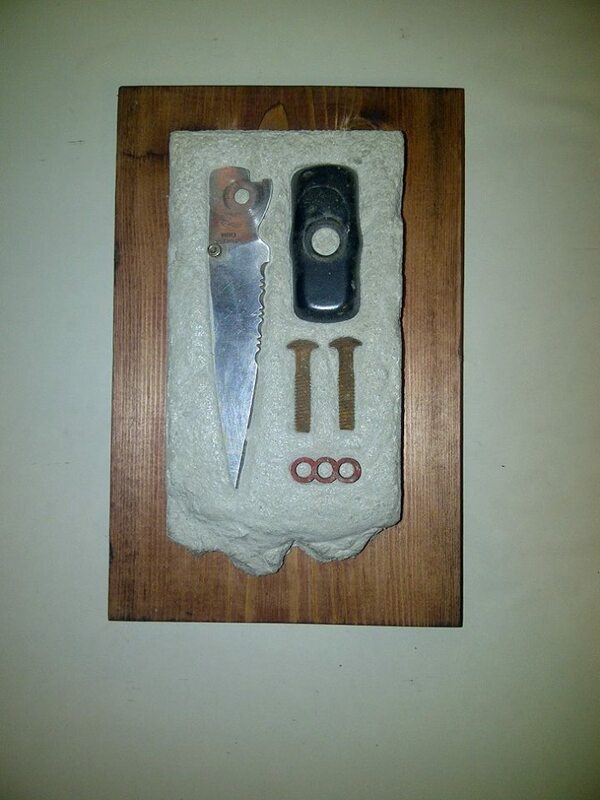 13" x 31.5" x 5.25"
"Shrine 5" Reclaimed lumber, found objects. 21" x 30" x 3.75"
"Signet 1" Glass, reclaimed lumber, paint. 5.5" x 11.5" x 1.5"
"Signet 3" Glass, reclaimed lumber, paint. 5.75" x 14.5" x 1.5"
"Signet 5" Glass, reclaimed lumber, paint. 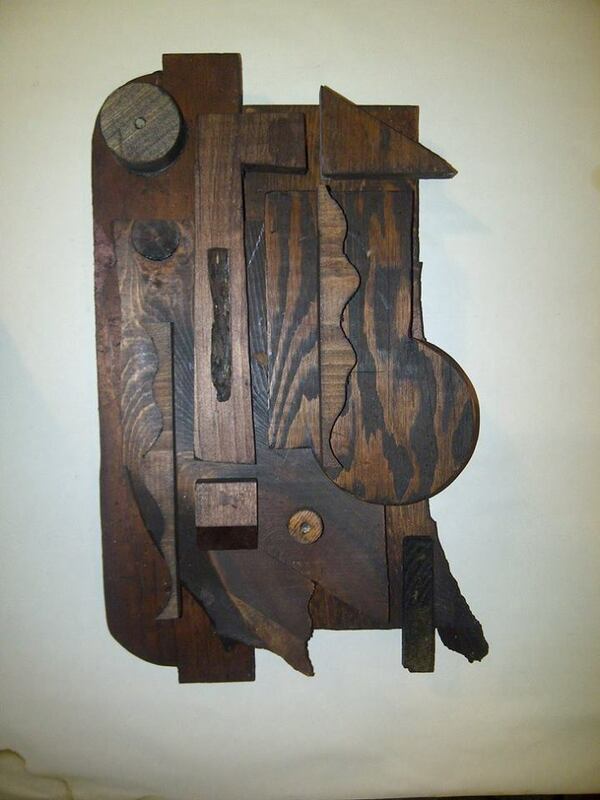 6.25" x 8.75" x 1.5"
"Ryan's Dream" Found objects, reclaimed lumber. 6" x 7" x 4"
"Lindsey's Dream" Found objects, reclaimed lumber. 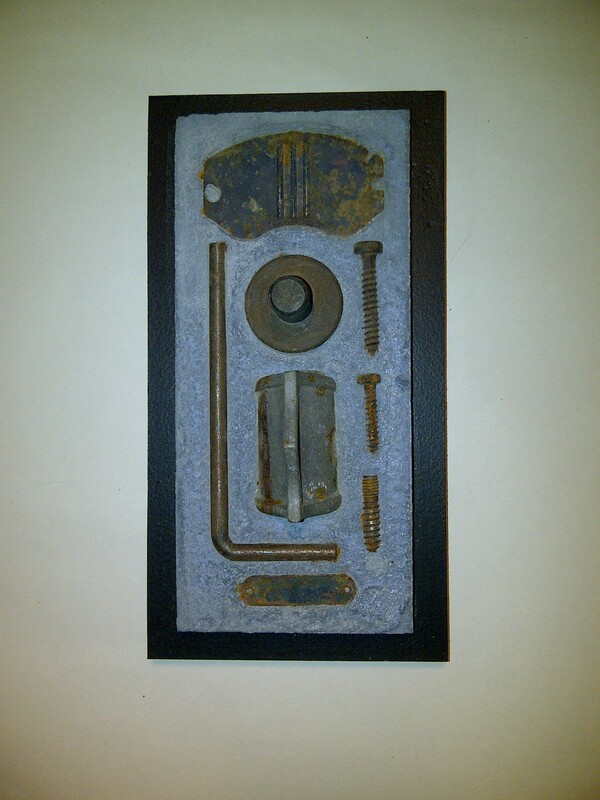 6" x 7" x 4"
The Metal Shop series is the large-scale result of my obsession with rusty and abandoned objects. 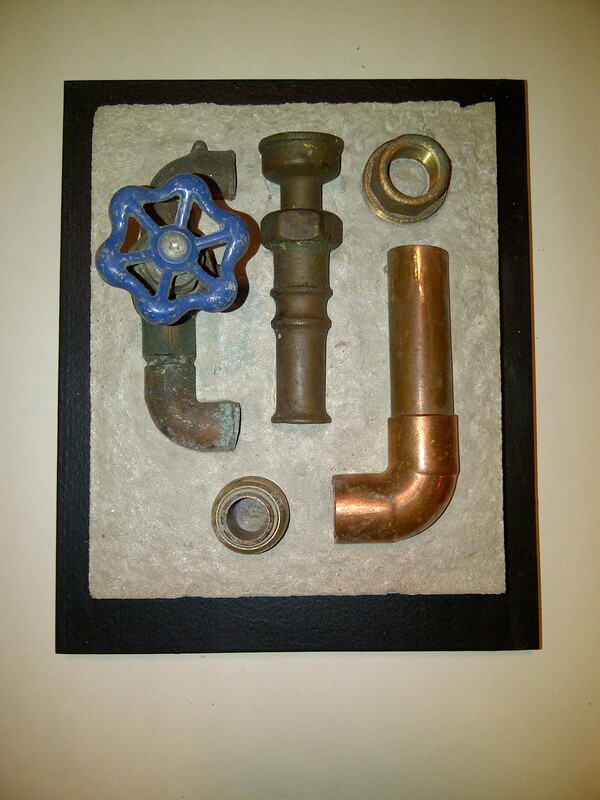 All the pieces are made from items found in the alleys of my Mount Vernon neighborhood. 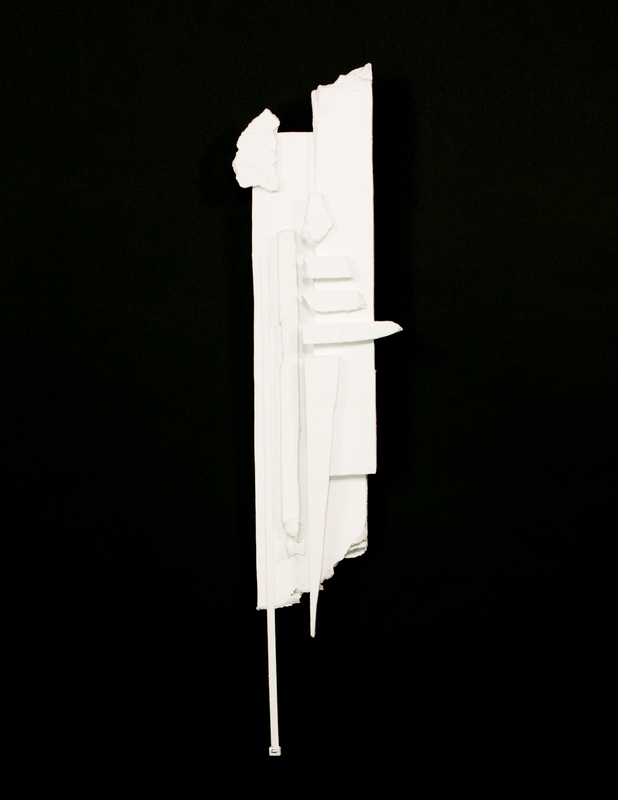 Each piece is assembled differently, depending on its materials and the desired composition. 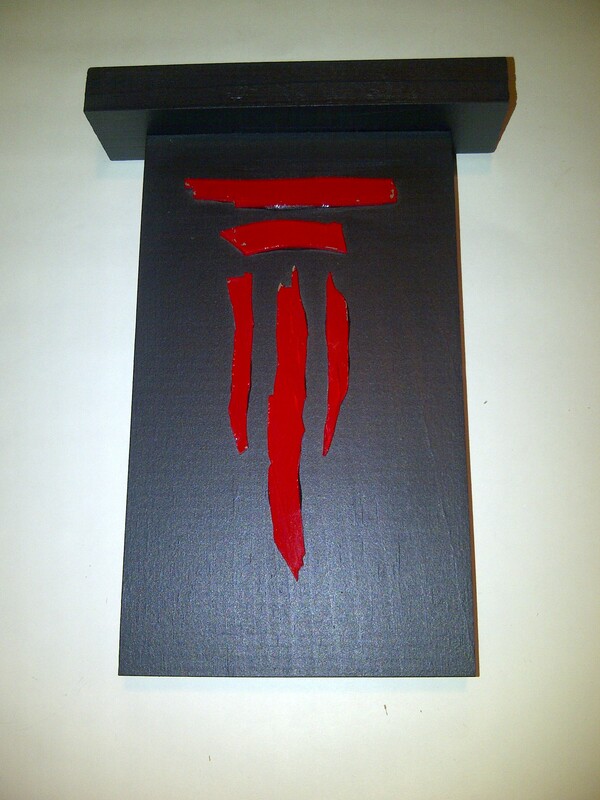 My sole purpose in creating them was to showcase what I consider to be the natural palette and paintbrush of decay. 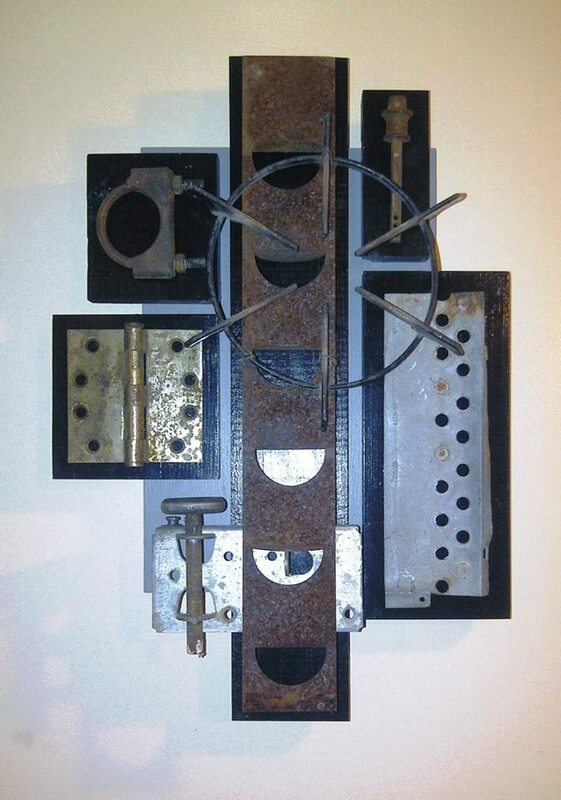 "Animus" Reclaimed metal. 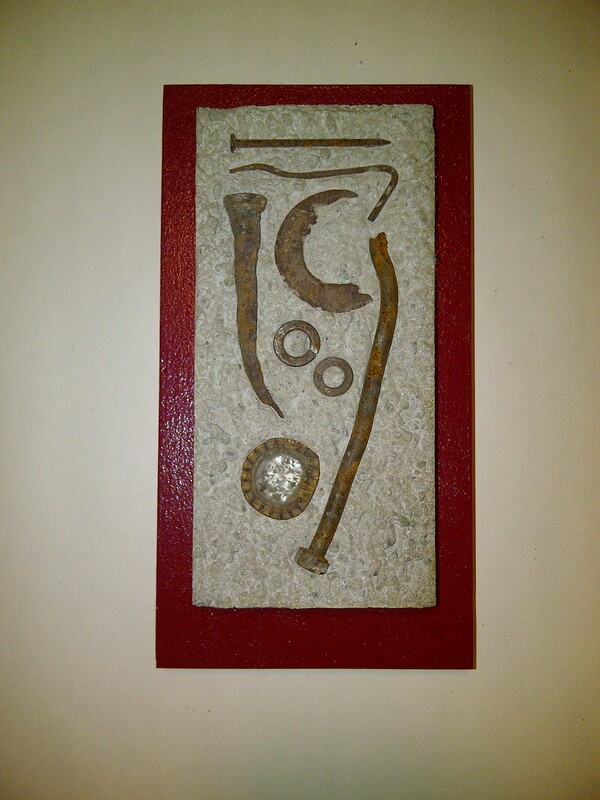 17.625" x 22.5" x 5.75"
The seeds of the Hieroglyph project took root over 20 years ago. For no discernable reason, I began pocketing little chunks of rusty metal and hardware that I found in the alleys and gutters of Baltimore. These bits of refuse seemed to resonate with character and some odd importance. During the summer of 2014, I began to arrange them into small compositions and embed them into slabs of reinforced concrete. The use of concrete seemed necessary to freeze them in time and preserve what I felt was their enigmatic message. There are 6 series included in this project, which were done over the course of a 3 year period. 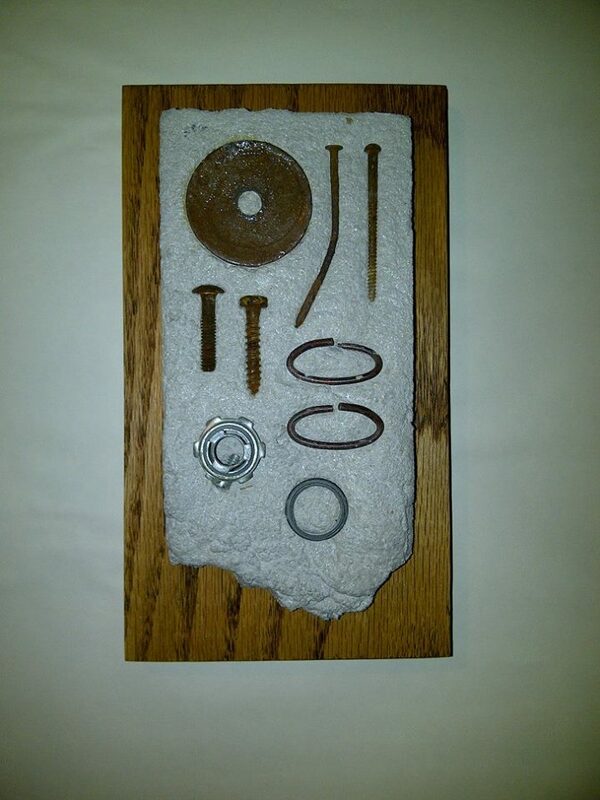 "Theorem 2" Found objects, concrete, reclaimed lumber, stain. 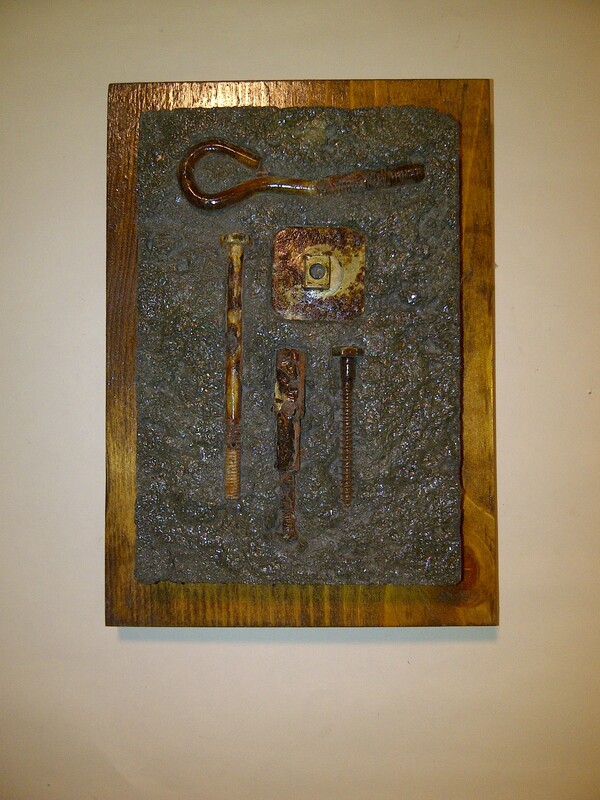 8" x 21" x 1.75"
"Glyph 6" Found objects, concrete, reclaimed lumber, stain. 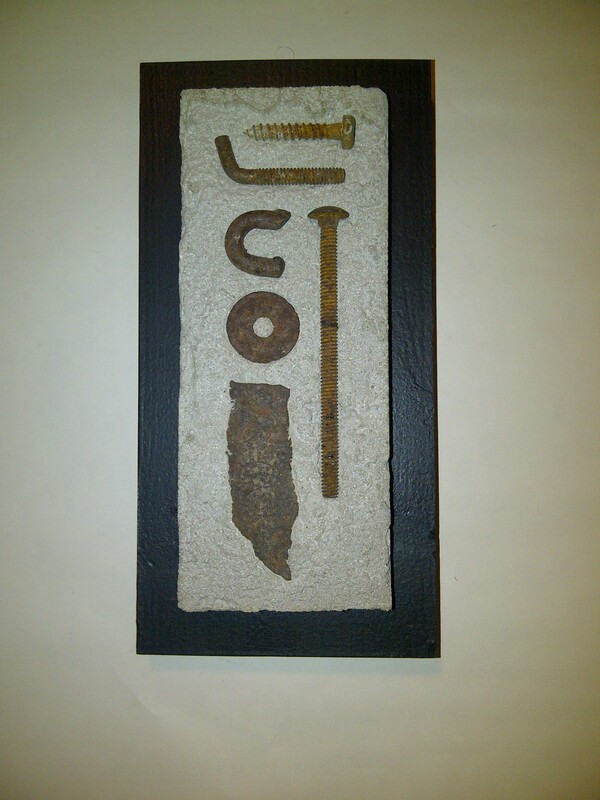 7.25" x 11" x 2.5"
"Codex 1" Found objects, concrete, reclaimed lumber, paint. 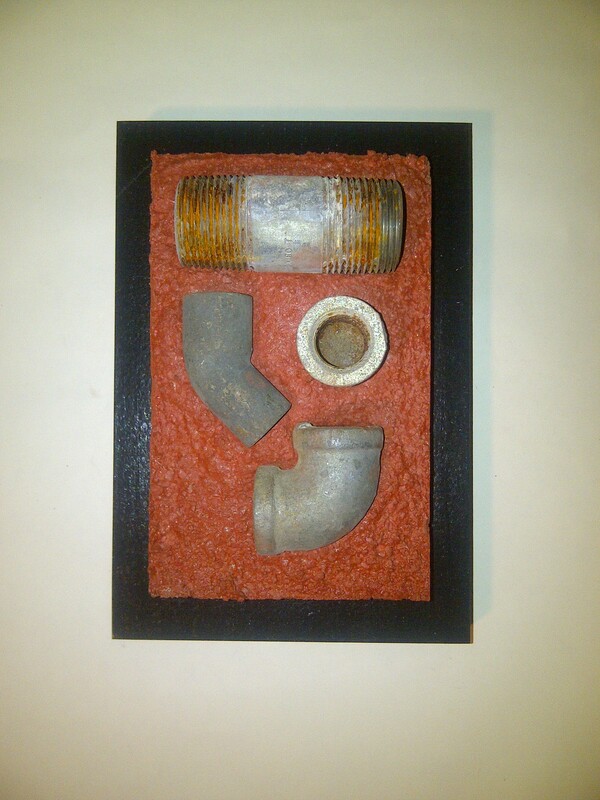 4.5" x 9 x 1.5"
"Codex 2" Found objects, concrete, reclaimed lumber, paint. 5.5" x 9" x 1.75"
"Edict 1" found objects, concrete, reclaimed lumber, stain 5.5" x 9.75" x 1.75"
"Edict 2" found objects, concrete, reclaimed lumber, stain 5.5" x 8" x 1.5"
My father is a retired electronic engineer and most of the PC boards in the Logic series were scavenged from old, discarded computers designed by the company he once worked for. 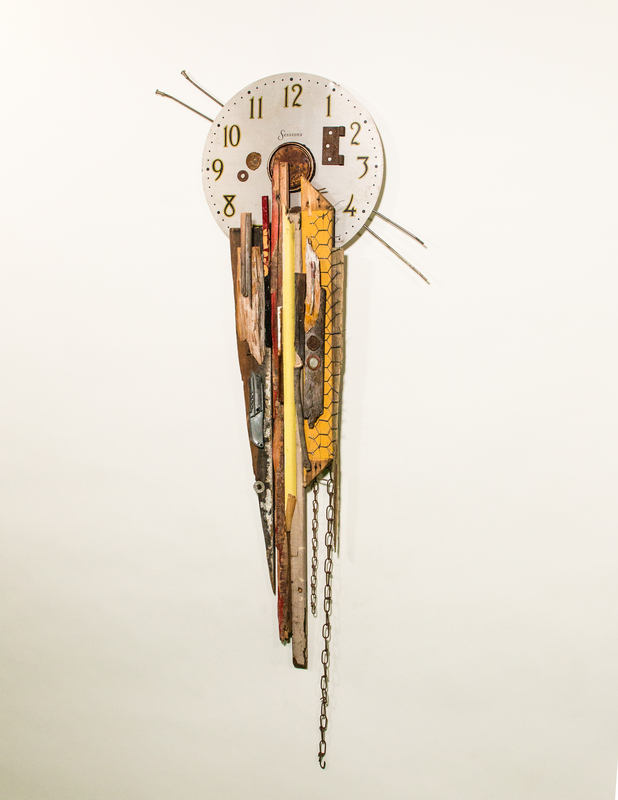 The unusual objects placed on top of them represent an attempt to reconcile my world with my father’s. I cannot communicate in his language of mathematics, but I can appreciate the desire for balance and the reduction of things to their simplest terms. 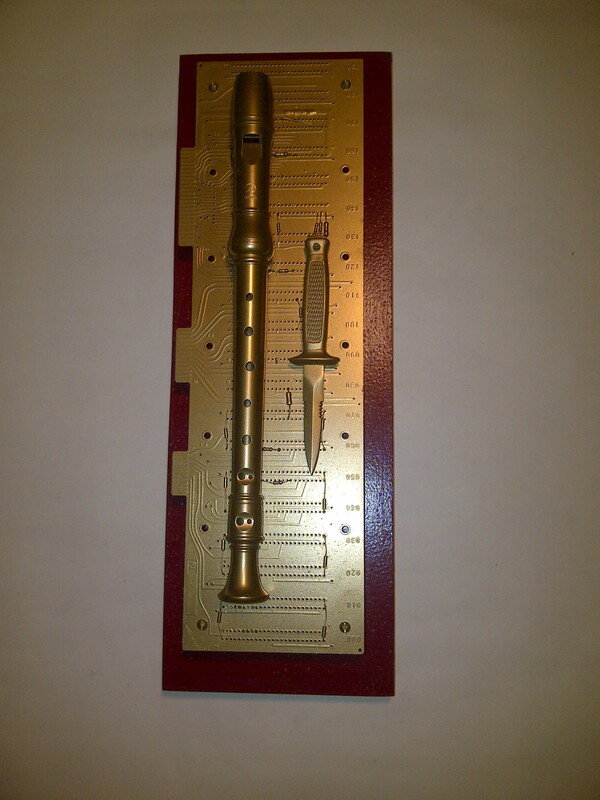 For me, the circuit boards are not the background for the composition, they are the foundation. The Logic series was created in 2016. 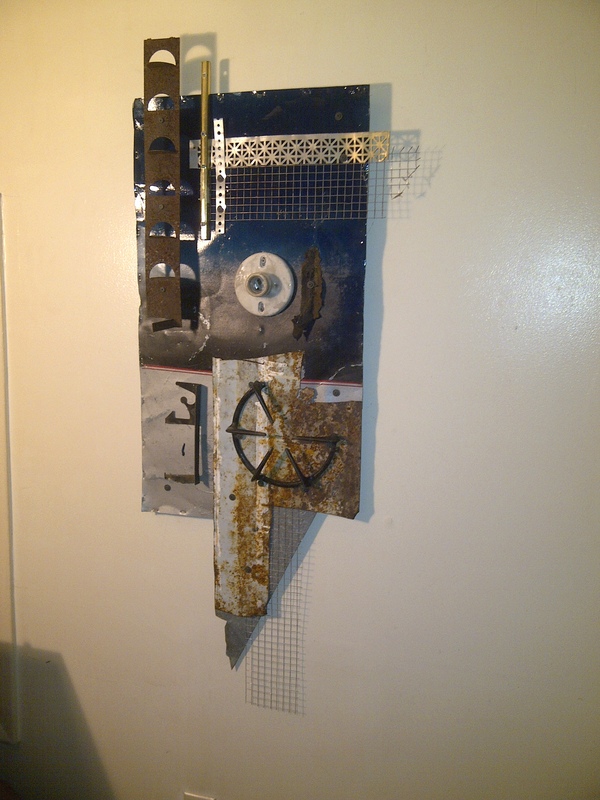 "Logic 1" Reclaimed PC board, found objects, reclaimed lumber, paint. 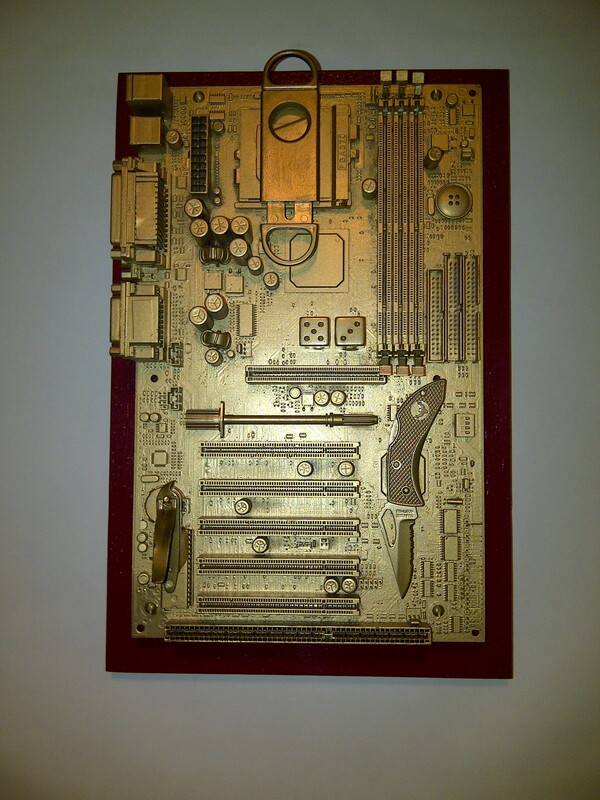 9" x 13.75" x 3.25"
"Logic 2" Reclaimed PC board, found objects, reclaimed lumber, paint. 5.75" x 16.75" x 2.75"
"Logic 3" Reclaimed PC board, found objects, reclaimed lumber, paint. 9" x 13.75" x 3.25"
"Logic 4" Reclaimed PC board, found objects, reclaimed lumber, paint. 5" x 8.75" x 2.25"
"Logic 5" Reclaimed PC board, found objects, reclaimed lumber, paint. 7.25" x 11.5" x 2.25"
"Logic 6" Reclaimed PC board, found objects, reclaimed lumber, paint. 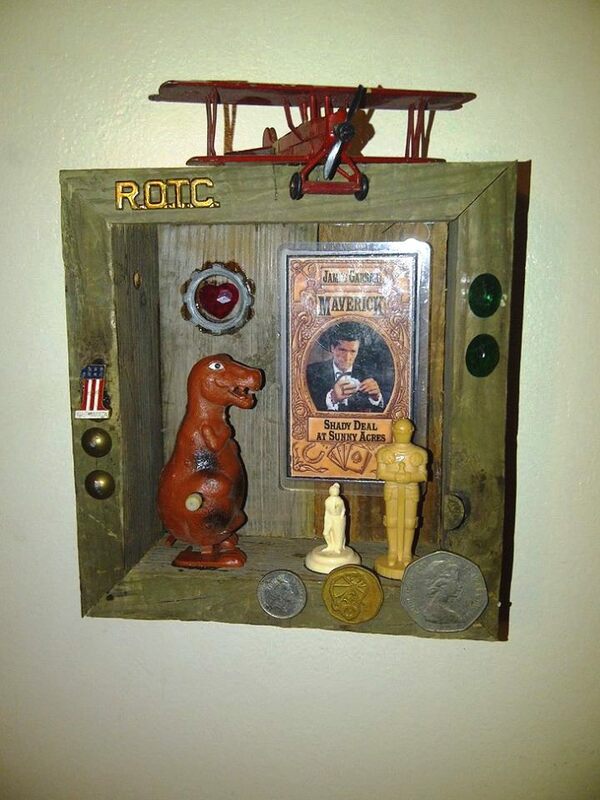 10" x 10.75" x 2.75"
"Logic 7" Reclaimed PC board, found objects, reclaimed lumber, paint. 4.5" x 6.5" x 2.75"
"Logic 8" Reclaimed PC board, found objects, reclaimed lumber, paint. 4.75" x 16.5" x 2.25"
The Glacial, Cloud Key and Rheotrope series were inspired by a gallery where I had a solo show in September of 2017. One room of the venue was painted completely black and I knew I had to create something specifically for that space. I chose to focus purely on texture and stark contrast using basic building materials and easily identifiable as well as somewhat cryptic found objects. I created 16 Glacials, 7 Cloud Keys and 8 Rheotropes total. 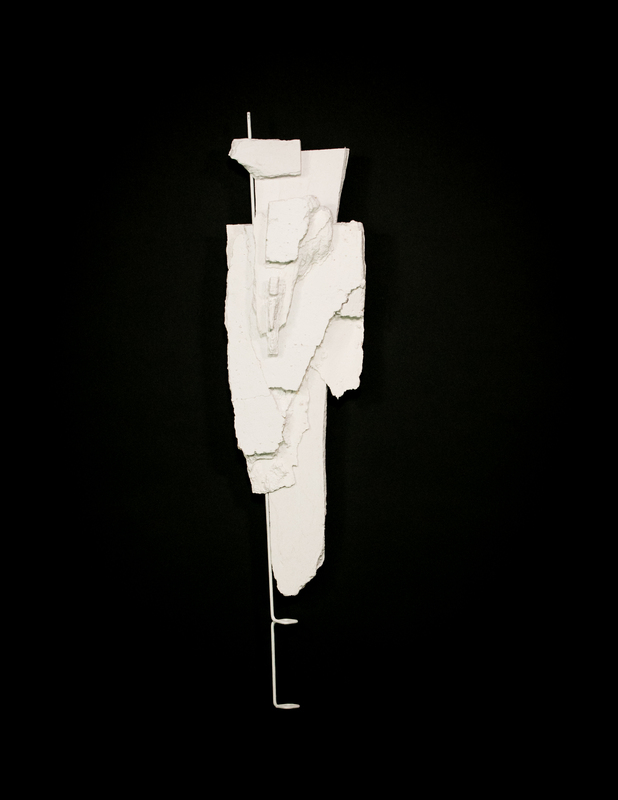 "Glacial 3" Reclaimed drywall, found object, paint. 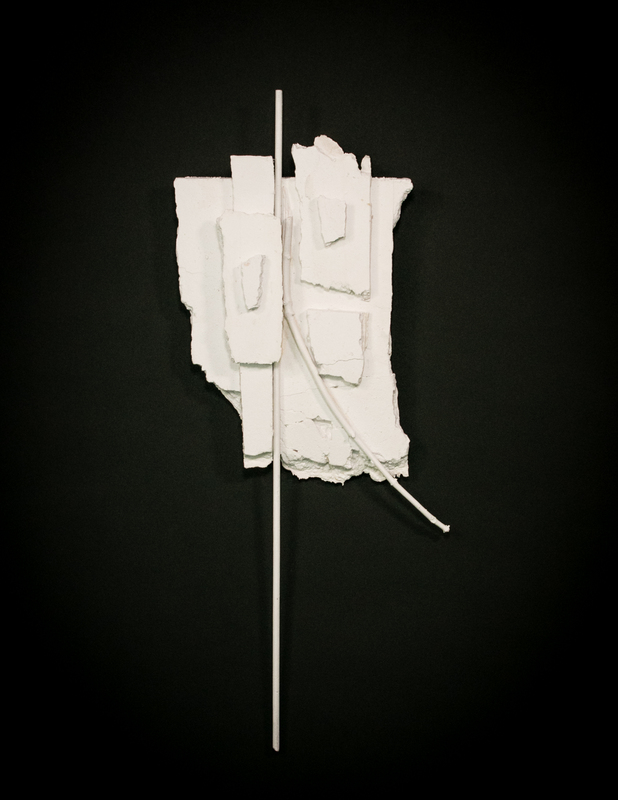 10.25" x 31.5" x 2.5"
"Glacial 1" Reclaimed drywall, found objects, paint. 11.25" x 30.5" x 2.5"
"Glacial 2" Reclaimed drywall, found objects, paint. 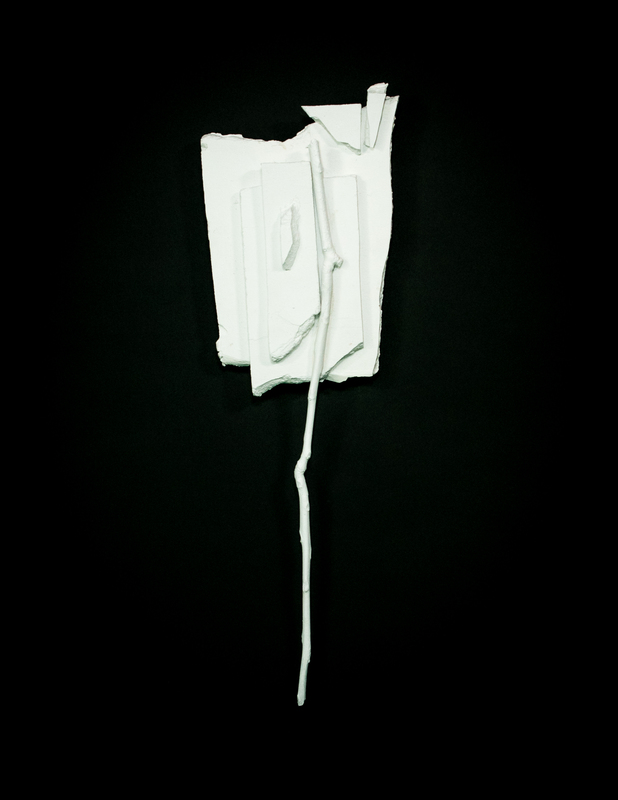 6" x 29" x 3"
"Glacial 4" Reclaimed drywall, found object, paint. 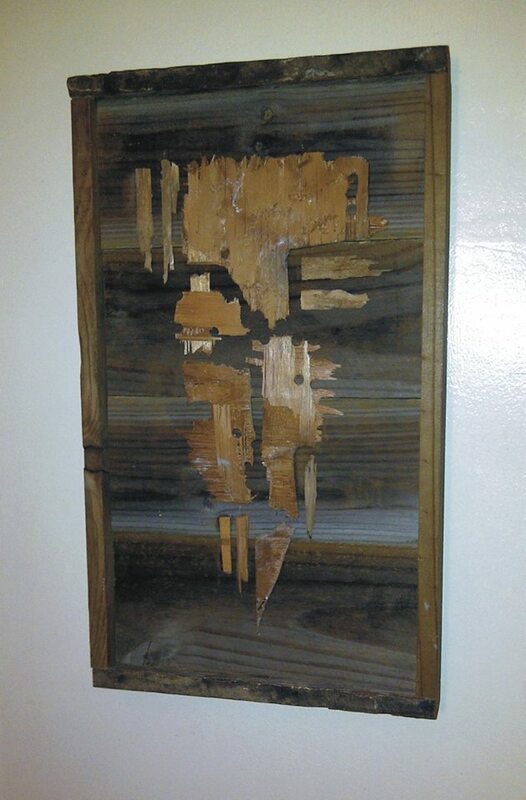 8" x 31" x 3"
"Glacial 5" Reclaimed drywall, found object, paint. 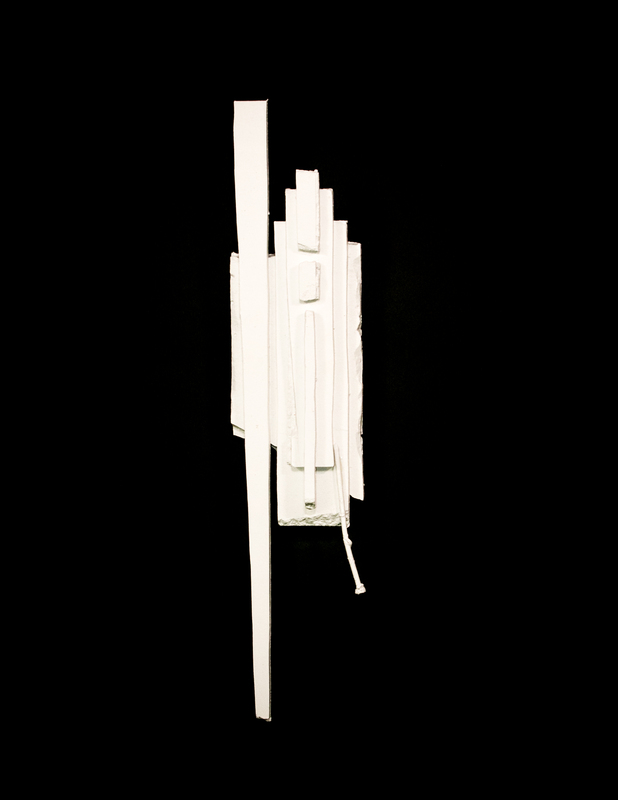 10.5" x 64" x 2"
"Glacial 6" Reclaimed drywall, found object, paint. 8.5" x 32" x 2.5"
"Cloud Key 1" Reclaimed lumber, paint. 8" x 30" x 3.5"
"Cloud Key 2" Reclaimed lumber, paint. 7" x 40" x 2.5"
"Cloud Key 3" Reclaimed lumber, paint. 9.25" x 40" x 3"
"Rheotrope 1" Found objects, paint. 10" x 16" x 2"
The pieces in the Woodshop series are 80-100% wood and are made from lumber torn out of my house, found in alleys, or donated to me by well-meaning friends. They were made between 2014 and the present. Some have been cut, sanded, painted or polyurethaned, while others have had nothing whatsoever done to change the character of the wood. 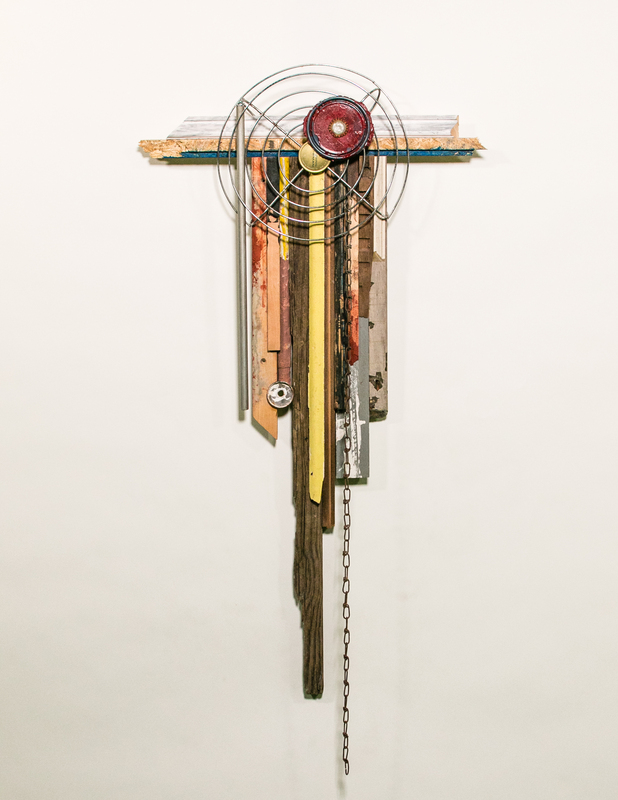 "Encoder 3" Reclaimed lumber, found objects, paint. 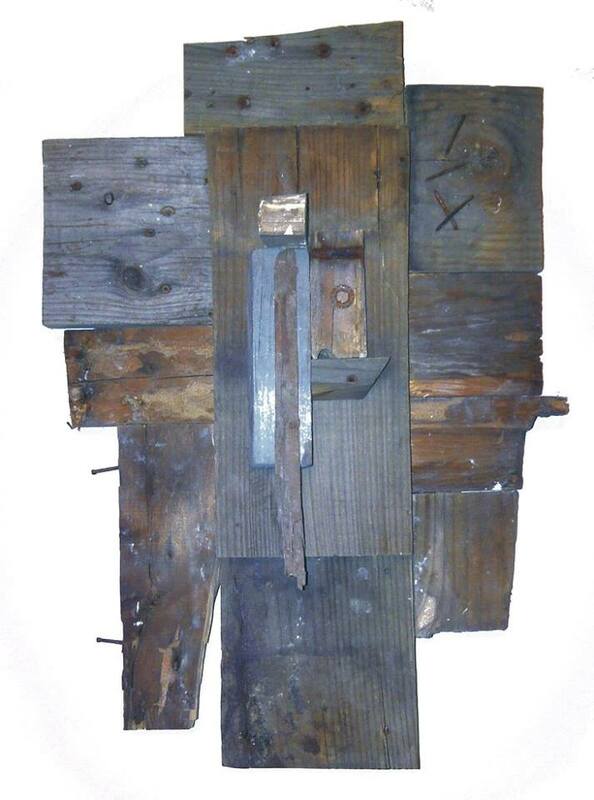 20" x 42" x 2.5"
"Cleric" Reclaimed lumber, found objects. 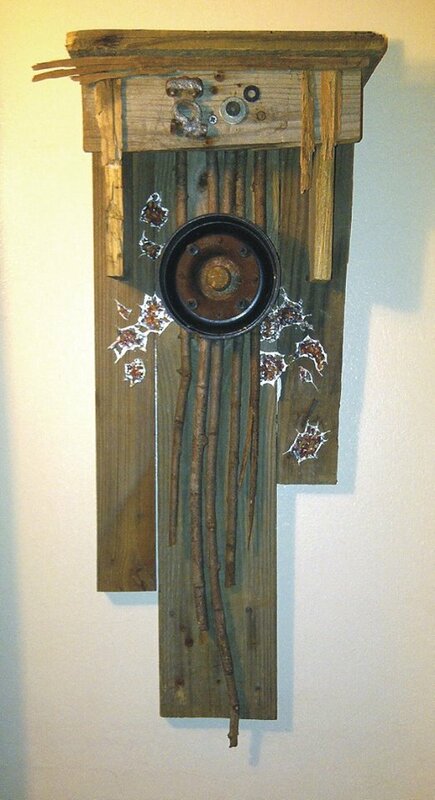 6" x 48" x 1.75""
"Encoder 2" Reclaimed lumber, found objects. 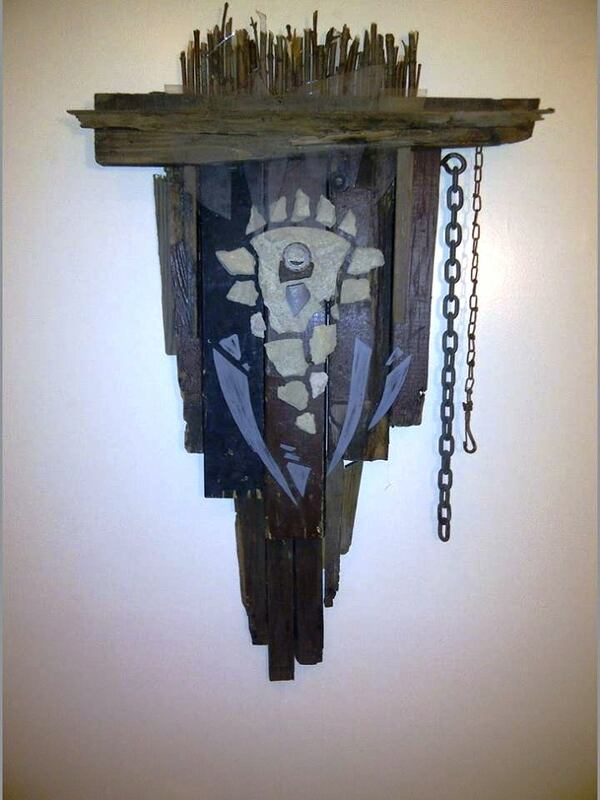 18" x 48" x 2"
"Shaman" Reclaimed lumber, found objects. 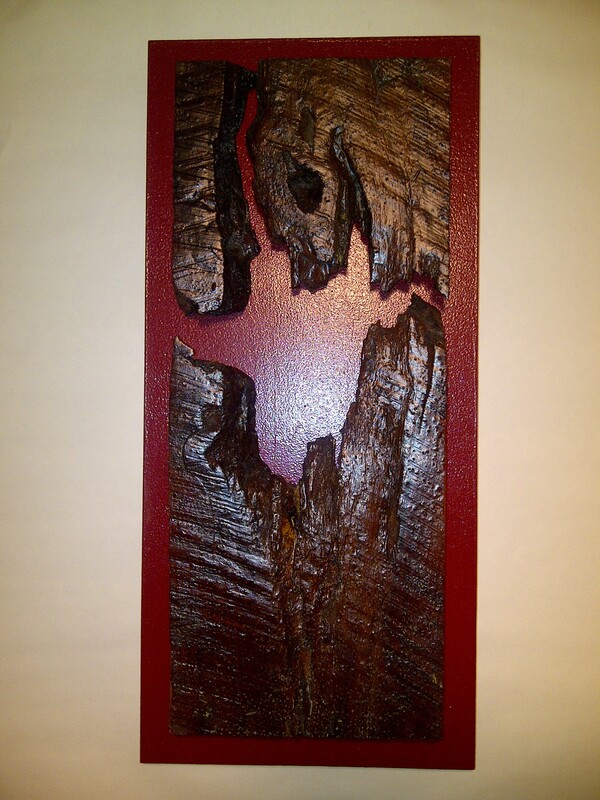 14" x 21" X 5"
"Relic" Reclaimed lumber. 13.625" x 23.375" x 2.125"
"Fusion" Reclaimed lumber, stain. 10" x 16" x 3.75"
"Bishop" Reclaimed lumber, stain. 7" x 16" x 2.75"
"Zephyr 1" Reclaimed lumber, stain. 8" x 10" x 2.5"
"Heartwood" Reclaimed lumber, stain, polyurathane. 9" x 19.5" x 1.75"
Preparation for the Watermark series was begun in the fall of 2015 after I replaced burst and leaking plumbing from the kitchens and bathrooms of my family’s homes as well as my own. I left the broken valves and scraps of pipe exposed over the winter in my backyard so they might “ripen” further with more oxidation. 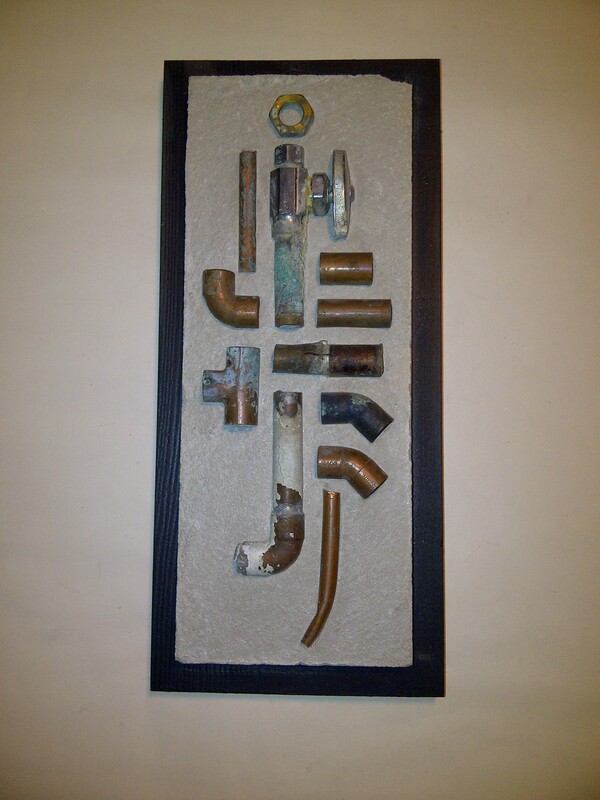 The composition of the plumbing in each piece was purely intuitive with little or no trimming to size. The concrete was sifted to eliminate larger chunks of aggregate and wire mesh was used to reinforce it. Standard concrete stain was used to tint the red pieces. 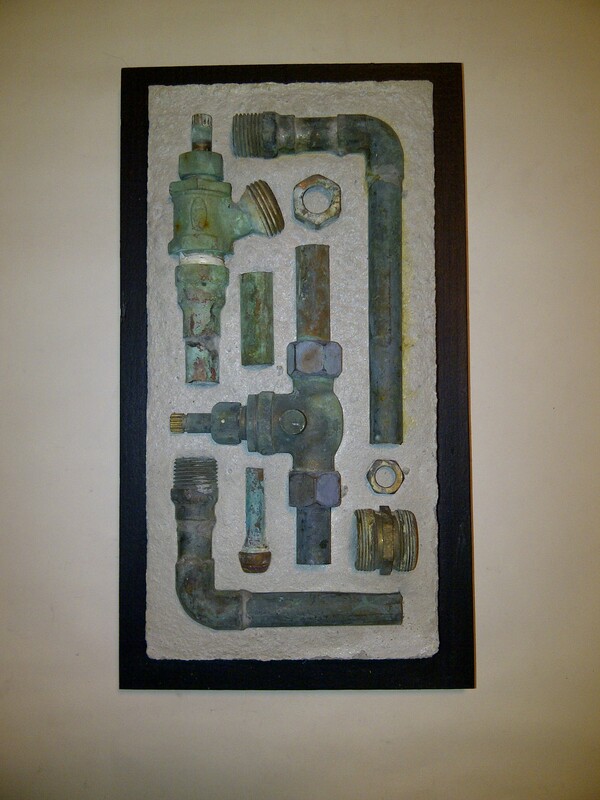 "Watermark 1" Reclaimed pipe, concrete, lumber, paint. 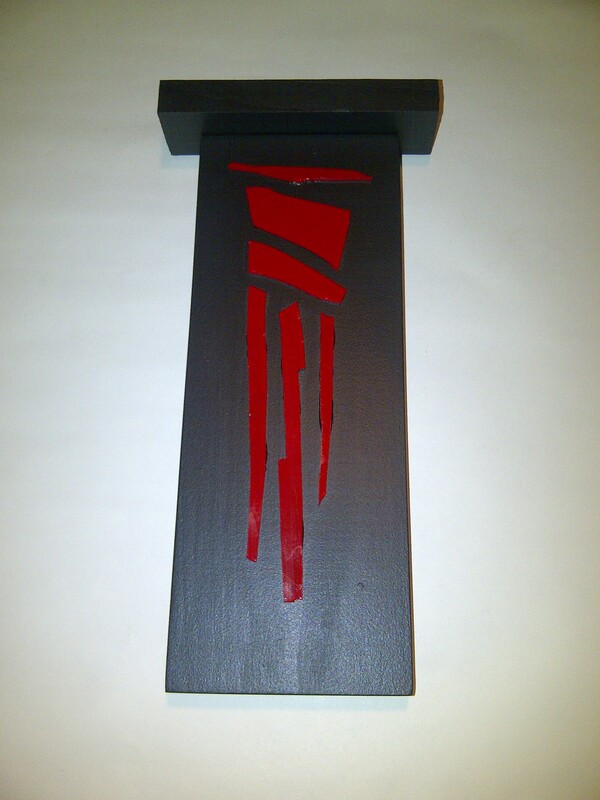 7" x 12.5" x 2.75"
"Watermark 2" Reclaimed pipe, concrete, lumber, paint. 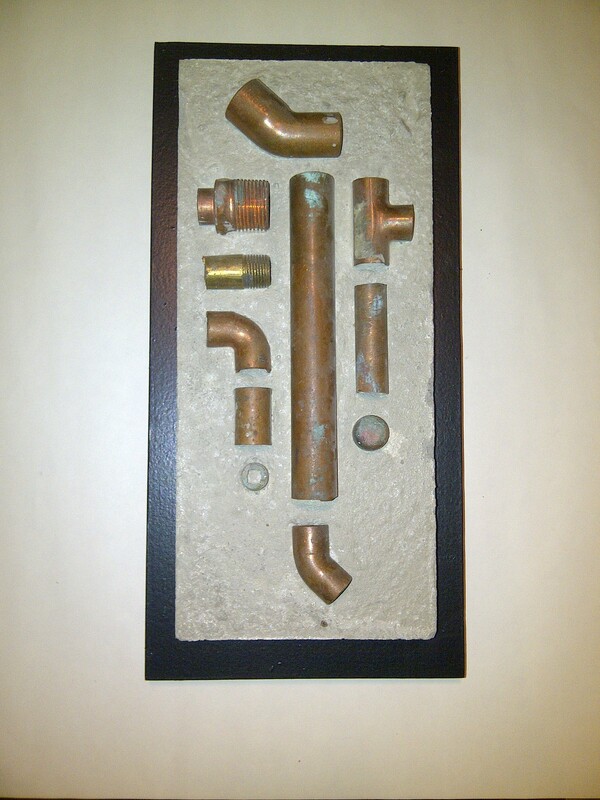 "Watermark 5" Reclaimed pipe, concrete, lumber, paint. 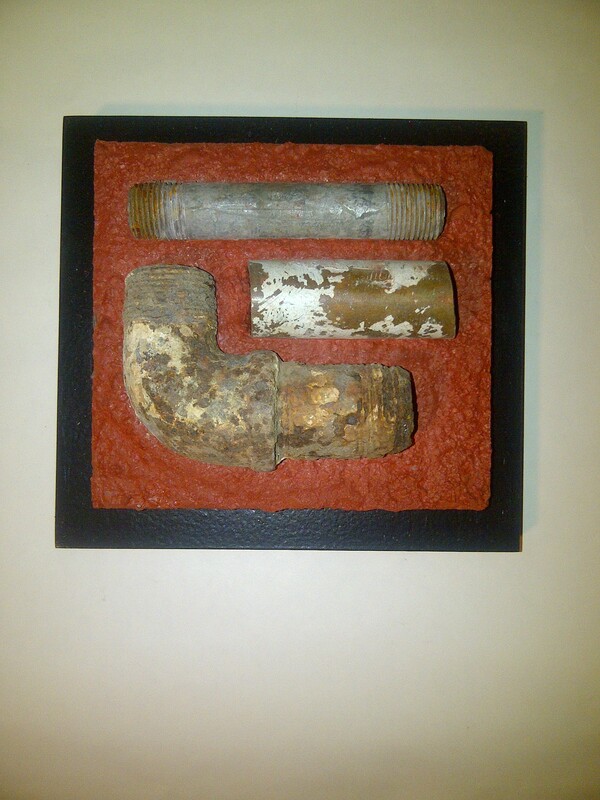 7.75" x 9" x 4"
"Watermark 7" Reclaimed pipe, concrete, lumber, paint. 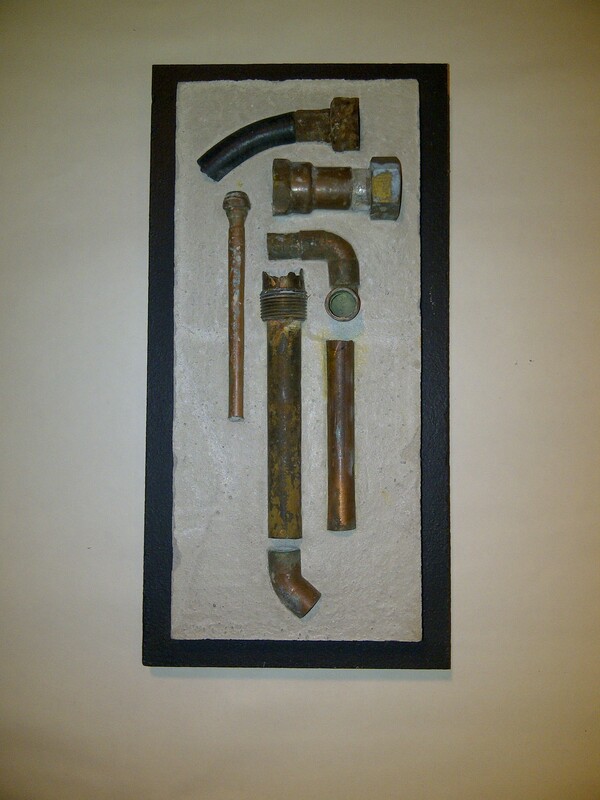 7" x 14" x 2.5"
"Watermark 4" Reclaimed pipe, concrete, lumber, paint. 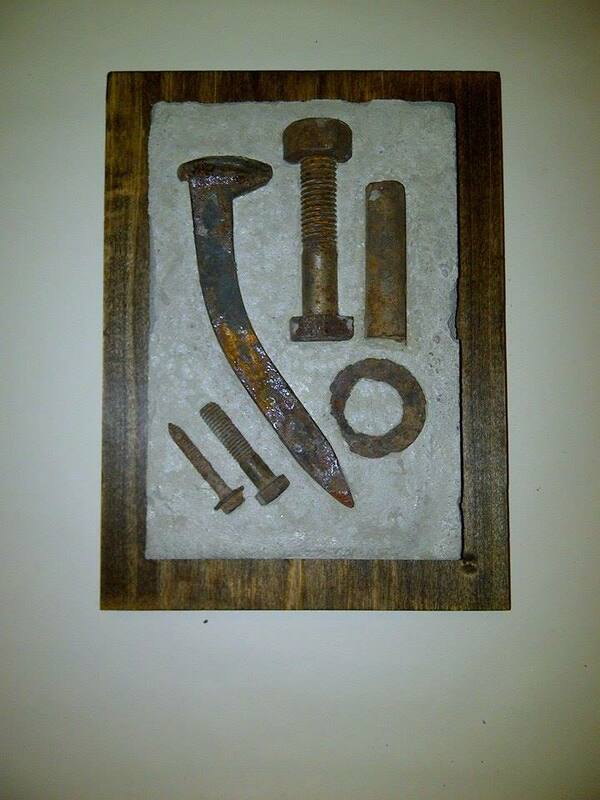 6.5" x 13.25" x 2.25"
"Watermark 6" Found objects, stained concrete, reclaimed lumber, paint. 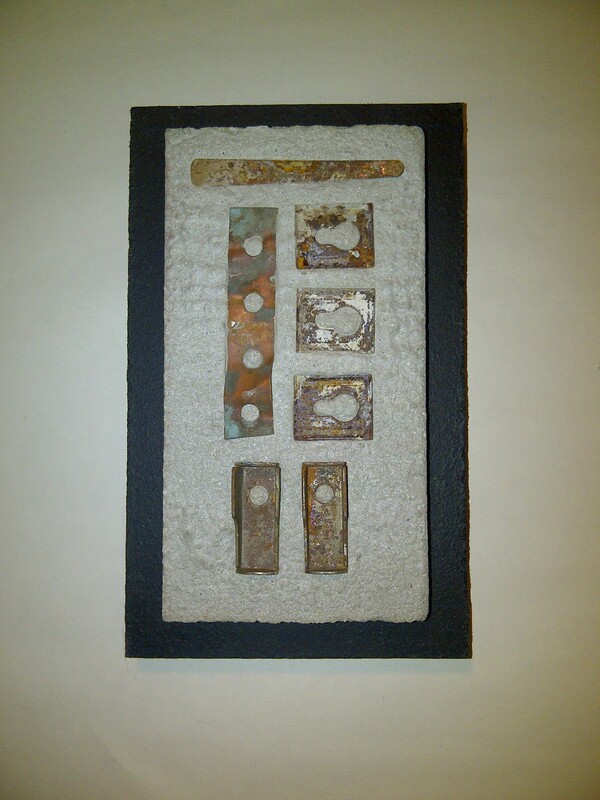 5.5" x 9.5" x 2.5"
"Watermark 8" Found objects, stained concrete, reclaimed lumber, paint. 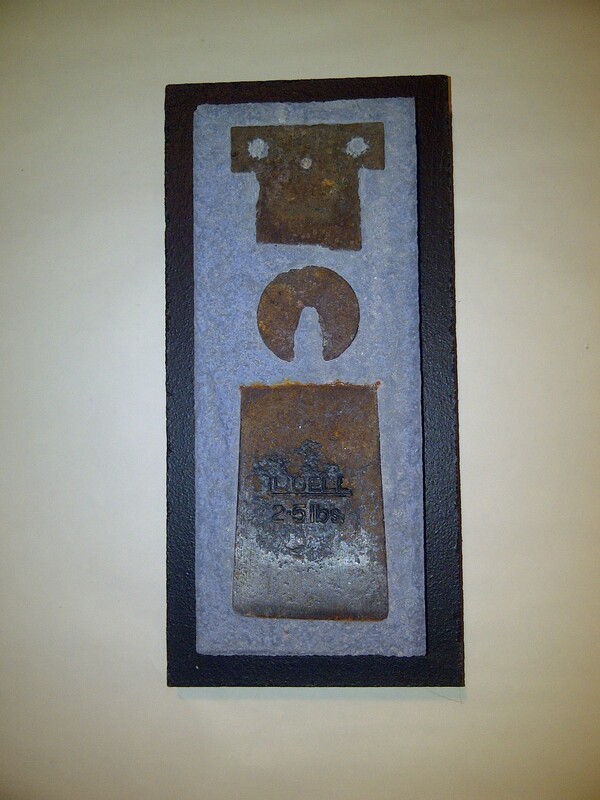 5.5" x 8" x 2.5"
"Watermark 9" Found objects, stained concrete, reclaimed lumber, paint. 7.5" x 7" x 2.5""
The Brush-offs came about as a result of the inevitable pile of ruined paint brushes after years of home renovations. Soaking them in lacquer thinner and then forgetting about them caused all the bristles to fall out completely. Since I never seem to be able to throw anything away, I decided I could do something creative with them, so I made pieces of art depicting useless paint brushes. It was so much fun I made 8 of them, and have 8 more planned. 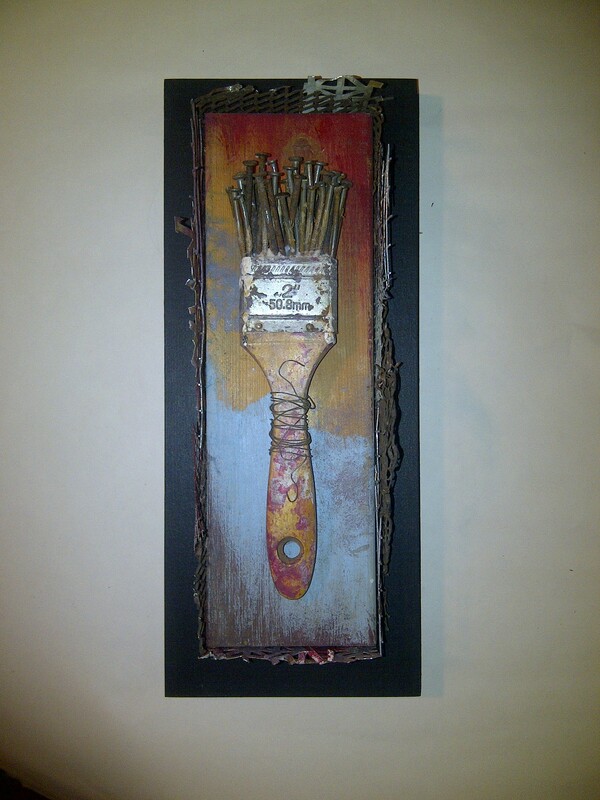 "Brush-off 7" Found objects, reclaimed lumber, paint. 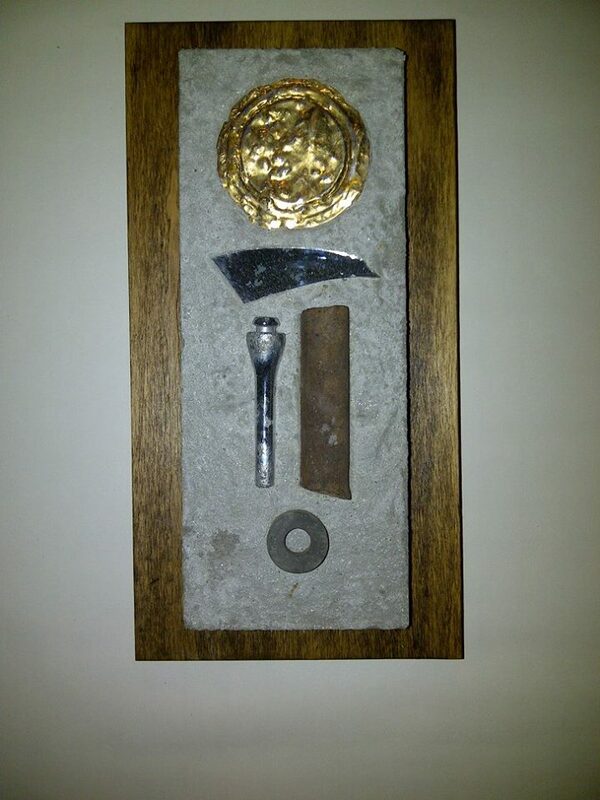 5.5" x 13.25" x 3.25"
"Brush-off 3" Found objects, reclaimed lumber, paint. 7" x 13.75" x 3.5"
"Brush-off 1" Found objects, reclaimed lumber, paint. 5.5" x 14.5" x 3.25"
"Brush-off 2" Found objects, reclaimed lumber, paint. 7" x 15.25" x 3.75"
"Brush-off 4" Found objects, reclaimed lumber, paint. 5.5" x 13.25" x 3"
"Brush-off 6" Found objects, reclaimed lumber, paint. 5.5" x 13.35" x 3"
"Brush-off 8" Found objects, reclaimed lumber, paint. 5.5" x 16" x 3.25"
The Geology pieces were experiments in stained concrete and background colors. Each was done in a set of 4 or 5 with similar proportions. The first series called Tourmaline had more complicated layers of coloring and polyurethane, along with a gilded edge effect. Each series got less complex, until I felt I had finished exploring the concept. 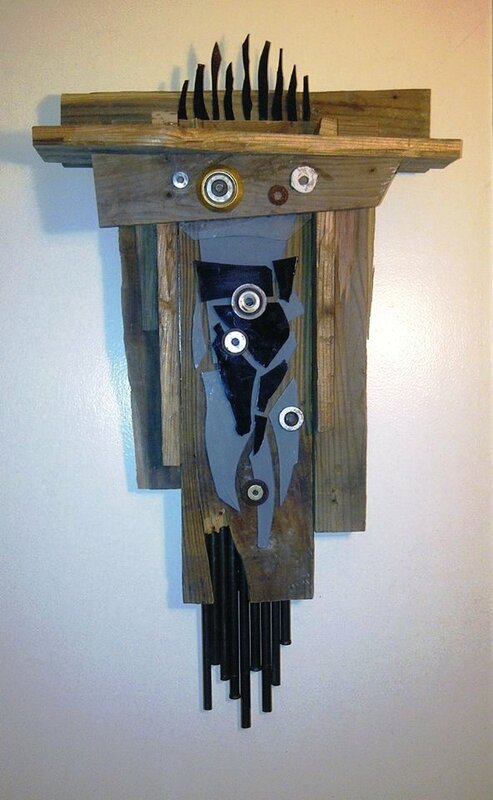 "Indigo 1" Found objects, stained concrete, reclaimed lumber, paint. 6" x 13" x 1.75"
"Indigo 2" Found objects, stained concrete, reclaimed lumber, paint. 6.5" x 12" x 2"
"Tourmaline 1" Found objects, stained concrete, polyurethane, reclaimed lumber, paint. 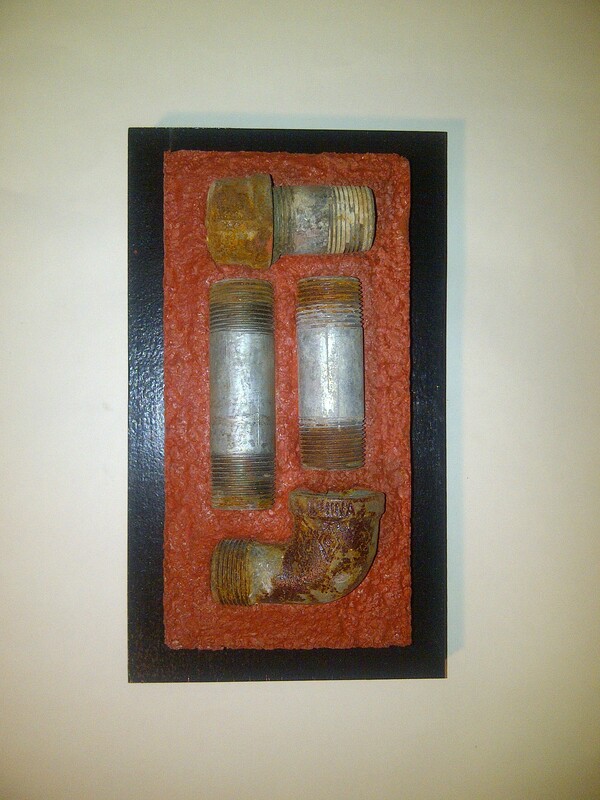 4.5" x 7.5" 2.5"
"Tourmaline 2" Found objects, stained concrete, polyurethane, reclaimed lumber, paint. 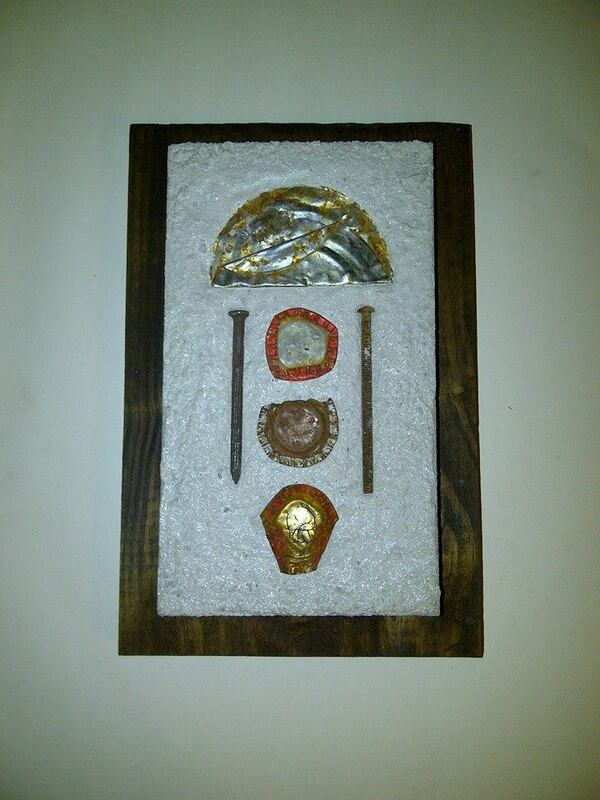 4.5" x 7.5" 2.5"
"Tourmaline 3" Found objects, stained concrete, polyurethane, reclaimed lumber, paint. 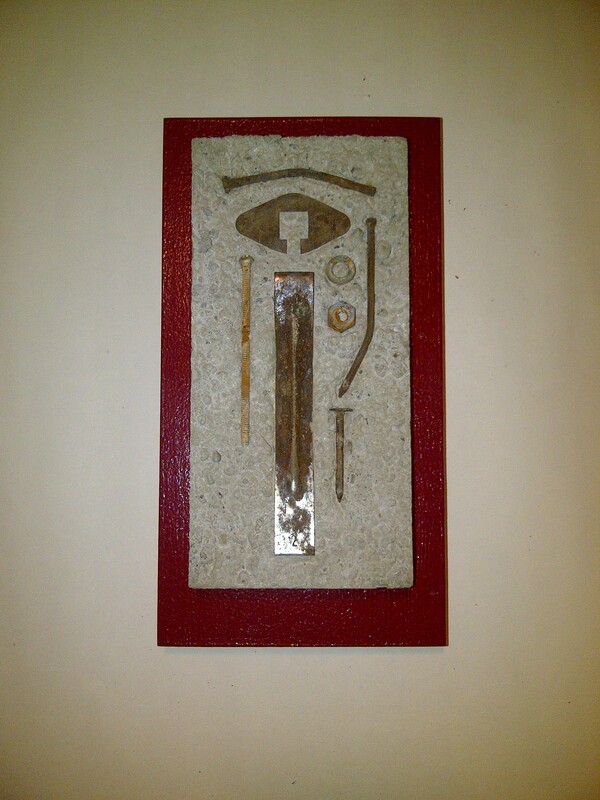 4.5" x 7.5" 2.5"
"Cinnabar 1" Found objects, concrete, reclaimed lumber, paint. 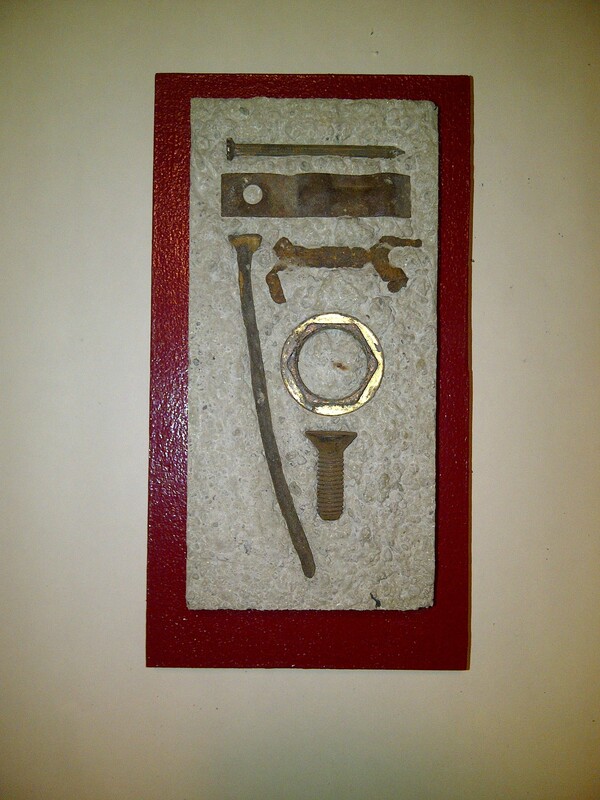 4.75" x 9" x 1.75"
"Cinnabar 4" Found objects, concrete, reclaimed lumber, paint. 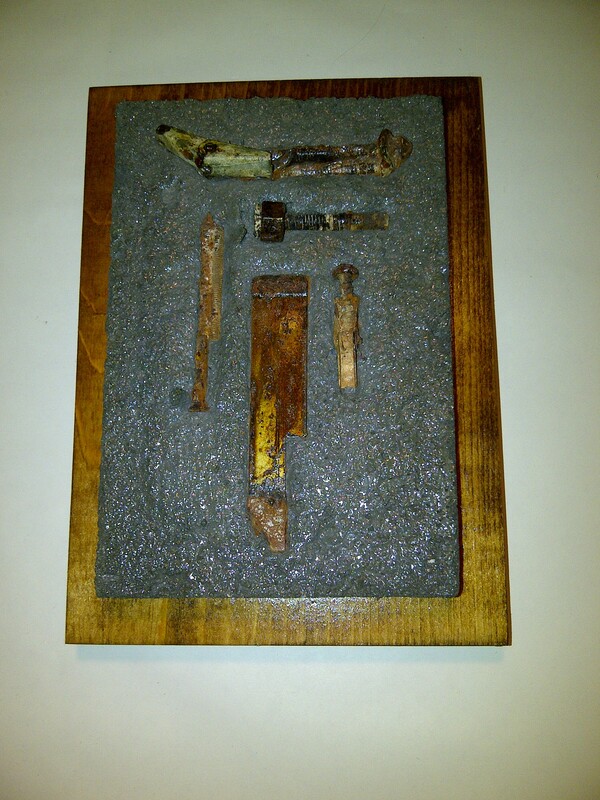 4.75" x 9" x 1.75"
"Topaz 1" Found objects, stained concrete, reclaimed lumber, stain, polyurethane. 6.5" x 9" x 1.75"
"Topaz 2" Found objects, stained concrete, reclaimed lumber, stain, polyurethane. 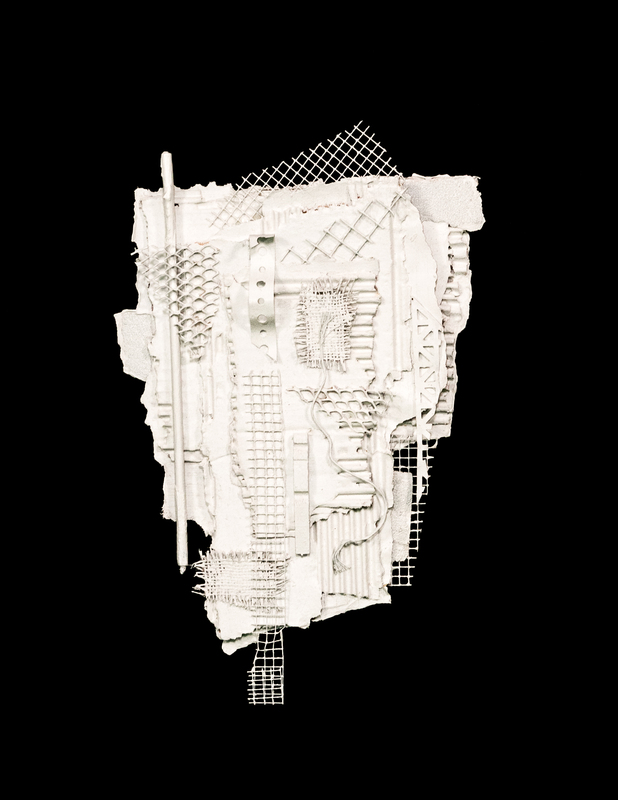 6.5" x 9" x 1.75"
The Interpreter series is comprised mainly of shattered or termite-eaten lumber I removed from my home during several of many renovations. 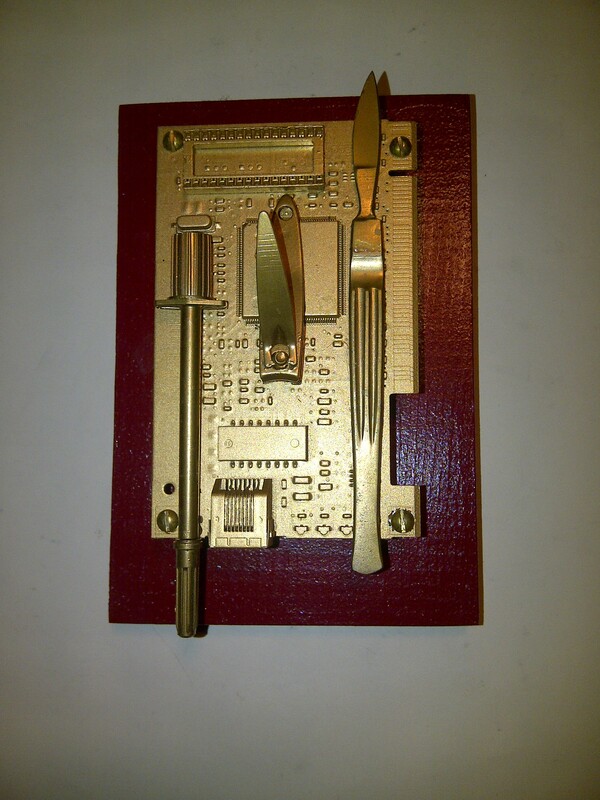 The Transceivers were pierced with large drill holes and punctuated with short lengths of doweling to add character and hint at some strange, mysterious mechanical purpose. Each piece was then stained to enhance the fracture lines and coated with 3 – 5 layers of polyurethane. 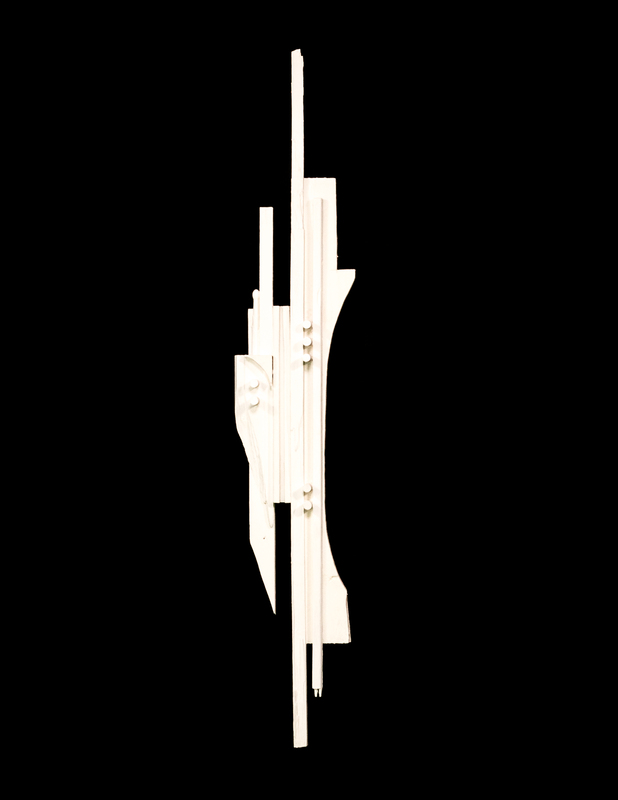 The Orpheum pieces are similar to the Transceivers but made on a smaller scale and with simpler compositions. 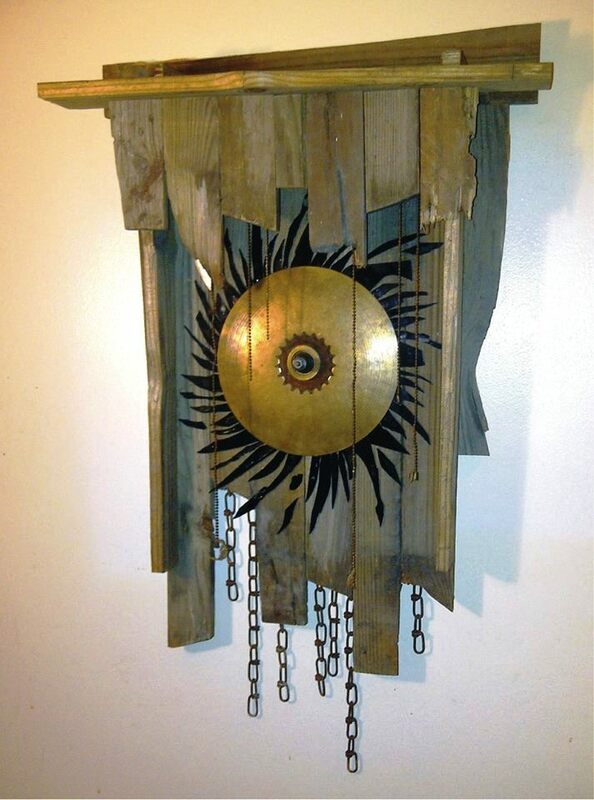 The Oracle piece has the added touches of branches from the dying tree in my backyard, an old circular saw blade and a broken rear view mirror from my motorcycle. 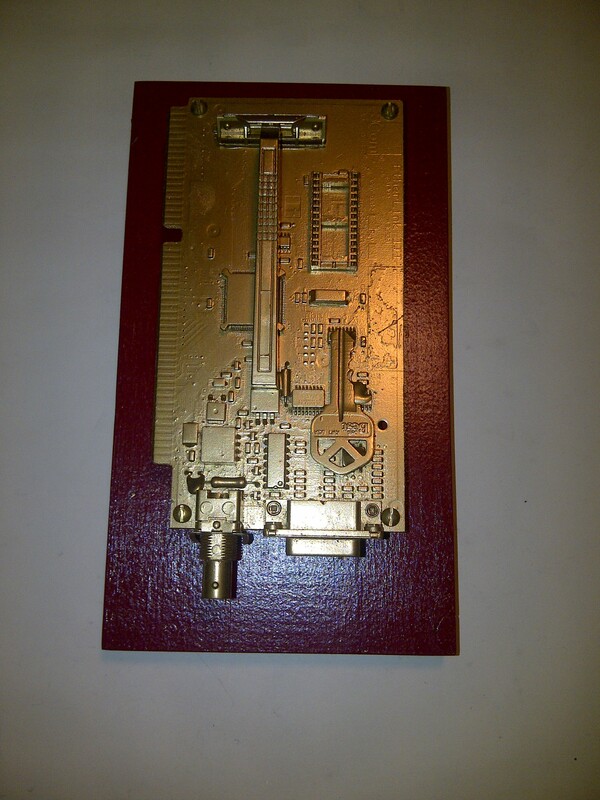 The Transceivers, of which there are 18 total, were made during the summer of 2016. Oracle was made during the fall of 2014. "Transceiver 1" Reclaimed lumber, wooden dowels, stain, polyurethane. 6" x 50.5" x 3"
"Transceiver 3" Reclaimed lumber, wooden dowels, stain, polyurethane. 9" x 58.5" x 4"
"Transceiver 4" Reclaimed lumber, wooden dowels, stain, polyurethane. 9" x 58.5" x 4"
"Transceiver 5" Reclaimed lumber, wooden dowels, stain, polyurethane. 8.5" x 36" x 3"
"Transceiver 6" Reclaimed lumber, wooden dowels, stain, polyurethane. 8.5" x 33.5" x 4.5"
"Transceiver 8" Reclaimed lumber, wooden dowels, stain, polyurethane. 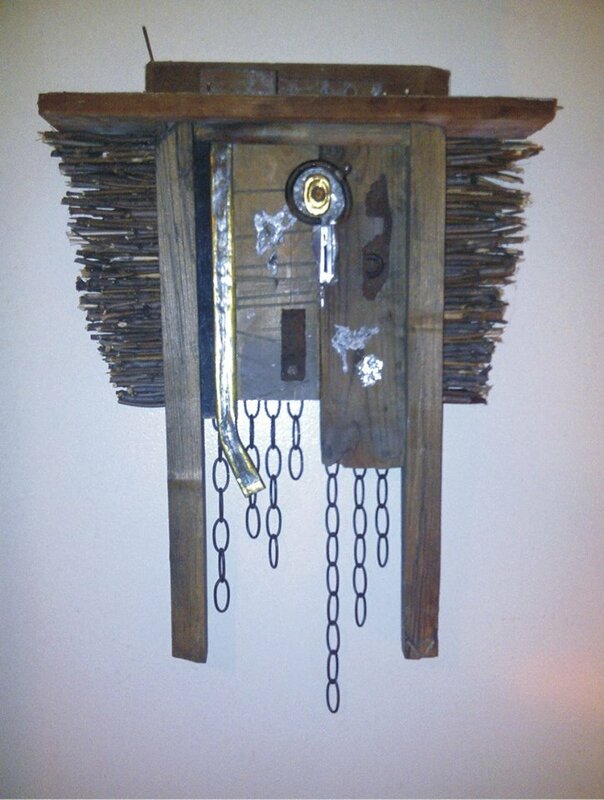 6.75" x 35.5" x 3"
"Oracle" Reclaimed lumber, tree branches, found objects. 32" x 62" x 3"
"Orpheum 1" Reclaimed lumber, doweling, stain, polyurethane. 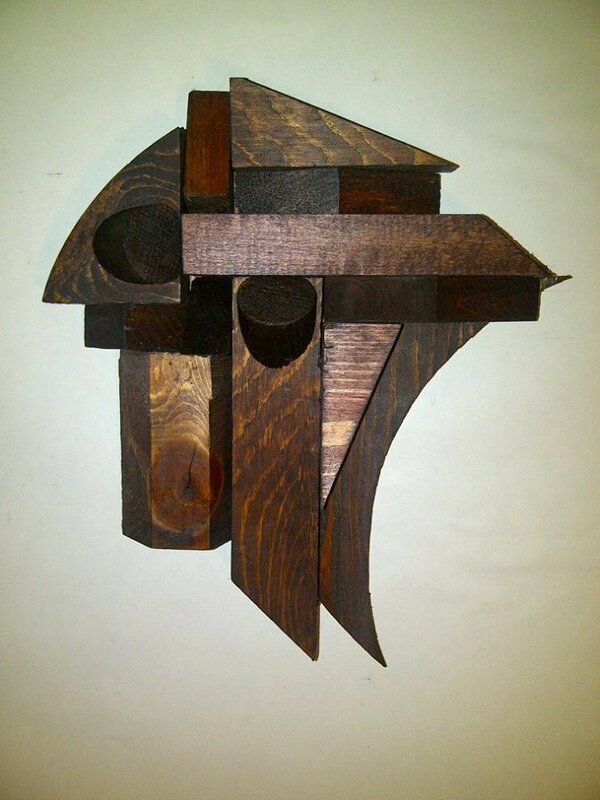 7.5" x 19.5" x 3.75"
"Orpheum 2" Reclaimed, stain, polyurethane. 5.5" x 13.5" x 3.5"